Jeremy Kuzmarov teaches at the University of Tulsa and is author of "Modernizing Repression: Police Training and Nation Building in the American Century"(Massachusetts, 2012) and "The Myth of the Addicted Army: Vietnam and the Modern War on Drugs" (Massachusetts, 2009). He is currently working on a book on the revolution in military affairs and American techno-war from the Korean War to the Endless War on Terror. Jimmy Carter’s illness has prompted an array of retrospectives of the man and his presidency both positive and negative. Missing from many of these commentaries is the fact that his presidency was crucial to the revival of American militarism after Vietnam even though Carter wants to be remembered as a peace president and spoke out against ill-considered military interventions later on. The 1970s was a watershed in American political history, as the country could have gone in two directions. Building off the momentum of the 1960s social movements, Democratic candidate George S. McGovern promoted a progressive economic vision and the scaling back of defense spending and overseas military commitments in the wake of the Vietnam debacle. Like his political hero Henry Wallace, McGovern’s platform scared societal elites who coordinated a vigorous counter-offensive, championing the reassertion of American military power as a moral counter-force to communism and a mechanism for overcoming the economic crises of the 1970s, including waning economic competitiveness, energy shortages and stagflation (inflation and unemployment). 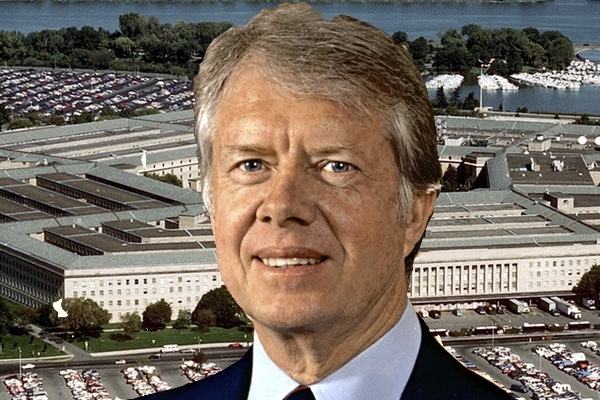 Jimmy Carter’s presidency helped to advance the neoconservative agenda by supporting the RMA that lay the groundwork for the revitalization of American military power after Vietnam. A wealthy land and agribusiness owner, Carter was part of the New Democrats, who wanted to push the party to the center after McGovern’s defeat in ‘72. His administration was dominated by members of the Trilateral Commission, an executive advisory committee to trans-national finance which envisioned a tri-polar world order led by the United States, Germany and Japan. It abandoned campaign pledges to cut defense spending by $7 billion, and initiated budgetary increases that in his last year amounted to the largest in history during peacetime. Under the direction of Defense Secretary Harold Brown, Air Force Secretary during the Vietnam War and former president of California Institute of Technology, heavy investment was made in the development of laser-guided bombs, space based satellite systems and fighter planes equipped with complex avionics systems consisting of large radars to detect enemy planes and computerized fire control systems. Funding for missiles increased $485 million or 63.5 percent, leading to the development of the Patriot Air Defense Missile system which gained fame in the Persian Gulf War, along with Tube-launched, optically tracked, wire-guided (TOW) antitank and “Tomahawk” cruise missiles built by General Dynamics which were accurate within a 100-foot range from 1,500 miles and possessed on-board computer guidance systems that allowed it to duck around hills and make necessary course corrections while eluding enemy radar. Remotely Piloted Vehicles (RPVs) equipped with TV cameras and a laser designator for target-spotting and sophisticated photo-mapping and communications systems were also advanced, along with Navstar, the precursor to Global Positioning System (GPS) in which satellites circling the earth at an altitude of 11,000 miles sent out signals allowing for users to determine their positions and velocity in three dimensions anywhere in the world under all-weather conditions. As part of the race to militarize space, the Pentagon even began developing killer satellites capable of hunting down and destroying enemy satellites along with alien spacecraft presumably, as a New York Times reporter joked! In promoting these new weapons systems, Carter’s presidency was crucial to the RMA’s policy dominance in ensuing years. Neglected in many academic studies1, this revolution, with its emphasis on precision-guided strikes and “smart weapons,” actually complemented Carter’s human rights agenda in its aim of facilitating public demand for a more “activist foreign policy” by fostering the illusion that wars could in the future be waged more cleanly and with less collateral damage. Carter to be sure was more dovish than his successor Ronald Reagan, promoting a soft-power approach in advancing U.S. geostrategic and corporate interests in line with the ideals of the Trilateral Commission. Carter’s administration renegotiated the Panama Canal Treaty and SALT II treaty with the Soviets mandating a reduction in nuclear missiles and bombers and secured the Camp David peace accords between Israel and Egypt. It also cut off aid to Latin America dictators and tried to reign in elements of what Peter Dale Scott has called “the deep state,” cutting the CIA’s budget by a third, prompting former agency operatives to establish their own “shadow CIA,” which worked to support traditional client regimes and promote American corporate interests through private contracts and off-the-books means. While governor of Georgia, however, Carter had supported Nixon’s bombing of North Vietnam and mining of harbors and as president sought to exonerate the United States from paying reparations to Vietnam, saying we “owe Hanoi no debt because the destruction from the war was mutual,” a bald lie. His human rights policy was uneven with his administration providing $2.3 billion in military aid to ten nations cited by Amnesty International for systematic human rights violations (Guatemala, Indonesia, El Salvador Morocco, the Philippines, South Korea, Taiwan and Thailand) along with $6 billion to Saudi Arabia and at least $12 billion to the Shah of Iran. Police aid was sustained through the cover of the Drug Enforcement Agency (DEA) with Carter’s administration championing herbicidal defoliation programs in Colombia and Mexico that destroyed nearly 60,000 acres of non-target vegetation causing pronounced health and environmental damage including contamination of drinking water. The appointment of neoconservative Zbigniew Brzezinski to replace Cyrus Vance as top national security adviser signaled a decisive shift away from a human rights agenda, which Carter had succeeded mainly in crafting into a “new language of power,” historian James Peck writes, “and potent ideological weapon for extending Washington’s global reach,” largely by focusing on abuses in the Soviet Union or Soviet client states. This transformation pushed many liberals to support military interventions for humanitarian purposes carried out through adoption of surgically precise strikes that could theoretically reduce human rights violations and casualties in war. Pressured by right-wing lobby groups like the Committee on the Present Danger, Carter during the last year of his presidency pushed for the development of a rapid mobility force warning the Soviets that “any attempt to gain control of the Persian Gulf region” would be regarded as an assault on the vital interests of the United States” and would be “repelled by any means necessary.” Carter had by this time taken an increasingly hardline stance toward the USSR, supporting covert operations and dissidents in Eastern Europe and funding mujahidin freedom fighters in Afghanistan in order to provoke a Soviet invasion. Robert Gates, former CIA director and Secretary of Defense under George W. Bush and Obama, noted that “the Carter administration waged ideological warfare on the Soviets with a determination and intensity that was very different from its predecessor by attacking the legitimacy of the Soviet government in the eyes of its own people.” The Carter presidency was thus crucial overall in reviving the Cold War after détente and rebuilding public consensus for a revived American militarism, laying the groundwork for Reaganism and the indefinite perpetuation of the American warfare state in the years thereafter. Carter’s career in turn casts light on the structural imperatives that lead fundamentally decent men who advance humanitarian causes as private citizens, to support policies and programs while in power that engender violence on a gargantuan scale, with Bill Clinton and Barack Obama having followed in his footsteps. 1Daniel Sargent in a generally comprehensive though overly top-down overview of U.S. foreign policy in the 1970s (A Superpower Transformed. Oxford University Press, 2014) omits discussion of Carter’s promotion of the RMA and its significance. David Schmitz is overly positive in his assessment of Carter’s human rights policy and evades his promotion of militarism in The United States and Right-Wing Dictatorships (New York: Cambridge University Press, 2006). Even James Peck in his outstanding and superior study, Ideal Illusions, neglects the importance of the RMA under Carter.